The idea started in a heart-to-heart with a mentor in London, remembers Nora Eckert ’17. It would turn out to be one of the most influential conversations of her life to date: Why not realize her wildest dream of becoming a talk show host who interviews inspiring people about provocative, difficult and challenging topics within a comfortable setting? Eckert returned from her semester abroad in London inspired. She launched her website, theconversationalistnora.com, in August of 2016 as she began her senior year at SNC. The Conversationalist has covered diverse ground, featuring among other subjects a Mumbai-born professional soccer player now studying cancer biology at Mayo Clinic; an acclaimed British artist; and the inventor of the first commercial microprocessor. “I believe in the idea of giving value to people’s experiences based on their background,” Eckert explains. “People’s perspectives are informed by where they’ve been.” She is passionate about breaking down cultural and ideological barriers through the art of thoughtful conversation. She also sees the value in the chance to connect with people across the globe, such as new fans who began watching after her conversation with the Indian soccer player/doctoral-candidate Jazeel Limzerwala. Greater challenges that she’s encountering include finding the time to devote to the editing and publishing process, and coming up with the financial resources to pay for tools such as the podcasting service she uses. Eckert says it’s important to her to “reach people where they are” by providing several formats for her content. “I try to create podcasts, articles and video content so they can listen to it the way they want to,” says Eckert. Her goal is to produce two video interviews each month, and podcasts on the opposite weeks – no small task to juggle while also completing her senior year of college and searching for a job. Eckert says the educational climate at St. Norbert College set the stage perfectly for her fascination with thought-provoking dialogue. “St. Norbert really emphasizes conversation in the classroom setting,” says Eckert. “I think I have started to value conversation more – conversations that aren’t just going to nurture your viewpoint but challenge it.” She has found no shortage of mentors at SNC who are willing to guide her with feedback, and inspire her with their personal courage. “It’s contagious,” she reflects. It must be. Through her experiences building The Conversationalist, Eckert found the courage to reconsider her passions and make a dramatic shift in her career focus. 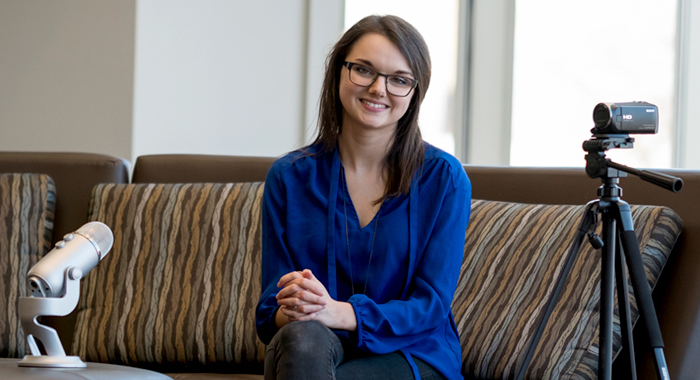 “When I saw young people going after what they really wanted to do, I found myself judging them, thinking, ‘That’s not practical.’ I realized that I could really develop negative attitudes if I don’t pursue what I am really passionate about.” Eckert is now leaning away from her original ambition, to attend law school. Instead she’s looking for jobs in copy-editing, marketing and technical writing. At the very least, the birth and growth of The Conversationalist gives Eckert a memorable conversation starter as she launches her career and talks with potential employers. This aspiring communications professional has not only turned her wildest dream into reality – she has created a robust triple-duty tool for networking, collecting career advice and portfolio creation.